On Friday, 24 April 2009, Rev. 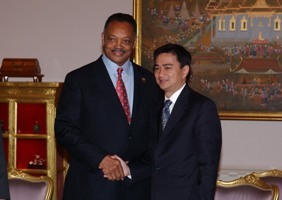 Jesse Jackson, an American civil rights activist and Baptist minister, called on the Prime Minister at the Purple Room, Thai Koo Fah Building, Government House. The Prime Minister welcomed Rev. Jackson and expressed satisfaction over the close and cordial diplomatic relations between Thailand and the US over the past 176 years. The relationship between the two countries have been multi-faceted and various fields, such as military, security, counter-terrorism, drugs trafficking, education, and public health as well as human rights and human trafficking issues. The Prime Minister thanked the US for cooperation on humanitarian issues. The Prime Minister informed Rev. Jackson of the decision of the Royal Thai Government to lift the emergency decree on 24 April 2009 and reassured that the political situation will not affect the interest of the US businesses in Thailand. The Prime Minister reaffirmed that the Government will strictly uphold its commitment to parliamentary democracy and constitutional monarchy and work to strengthen the rule of law, justice and transparency. Rev. Jackson commended the Government for its commitment to non-violence. The Prime Minister also discussed with Rev. Jackson political reform in Thailand. Rev. Jackson highlighted that, despite the current political situation in Thailand and the global economic downturn, the needs of the vulnerable parts of society, especially the elderly and youth, must not be forgotten. The Prime Minister discussed with Rev. Jackson Thailand's economic stimulus packages, including cash handouts and free education programs, which directly benefit the elderly and youth. The Prime Minister also outlined the three urgent goals of the Government, namely, to restore Thailand's international reputation, revive the economy through stimulus packages and allow a period for cooling down and to take the peaceful approach. Rev. Jackson expressed appreciation to Prime Minister and commended the Government for its efforts to find a sustainable solution to the political conflict.